왜가리는 우리나라의 백로과 새들 중에서 제일 큰 새로 우리나라 전지역에 걸쳐 번식하는 여름새이며, 일부는 남쪽 지방과 섬 지방에서 겨울을 나는 텃새이다. 논·하천·간석지에서 살며 개구리, 물고기, 뱀 등을 잡아 먹는다. 진천의 왜가리 번식지는 1970년까지 노원리 보호 지역내에서 자라고 있는 은행나무를 중심으로 수백 마리의 백로류 및 왜가리가 번식하여 왔다. 그러나 현재는 이 은행나무가 새들의 배설물에 의해 말라 죽어가고 있으며, 5∼6개 둥지의 중대백로만 남아 있고, 왜가리와 백로들은 주변 숲으로 옮겨 살고 있다. 진천의 왜가리 번식지는 수질 오염으로 인해 왜가리의 먹이가 되는 개구리, 미꾸라지 등이 줄어 수가 감소되었으나, 우리나라 왜가리 번식지를 대표하는 지역이므로 천연기념물로 지정하여 보호하고 있다. The heron is the largest bird of the egret family in Korea. Herons are summer birds that breed throughout Korea, although some winter in the south of the peninsula and on certain islands. They generally inhabit rice fields, streams, and tideland areas, and eat frogs, fish and snakes. 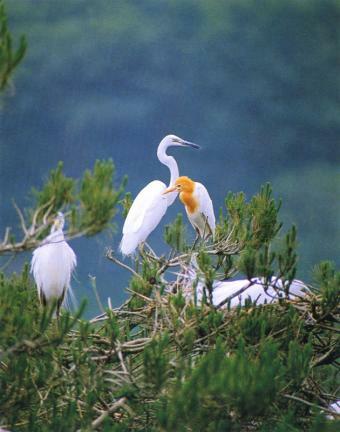 The Breeding Ground of Grey Herons in Jincheon has been a breeding ground for egrets and herons mainly around the ginkgo tree in the Nowon-ri preservation area since the 1970s. 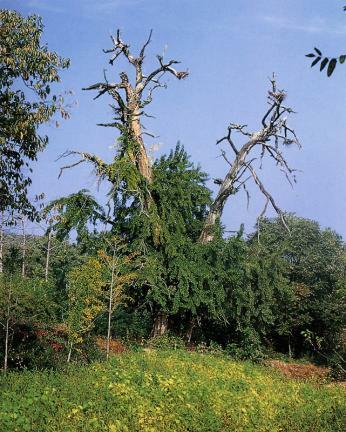 However, the tree is dying owing to the birds’ excrement, so only five or six nests occupied by medium and large-sized herons remain, while all the other grey herons and egrets have migrated to a neighboring forest. 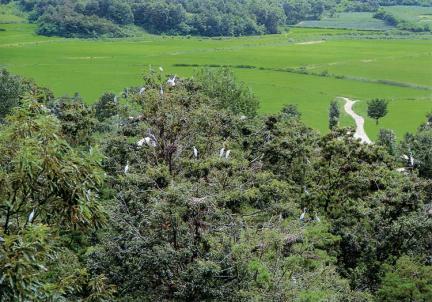 The Breeding Ground of Grey Herons in Jincheon has been designated as Natural Monument (No. 13) to protect it from water pollution and a fall in the number of herons due to the decline of their food sources, including frogs and loaches, etc.